Question: How long should a prepackaged leader last? I feel like I’m going through them pretty fast, and they’re not cheap. Answer: As with many such questions, the answer is “it depends.” In the case of how much use you can get out of a single prepackaged, tapered leader, it depends on three factors: your skill as a caster, how much abuse you subject the leader to, and how you go about adding tippet material. Let’s start with the last one first. Whenever you buy a knotless tapered leader, you should add a foot or two of tippet material to the end. That way, as you change flies and trim off material, you’re not cutting into the more-expensive leader, but using up the cheaper tippet material. Many anglers will start off with just the tapered leader and then start adding as it gets shorter, but then you’re not always sure what the diameter of the end of the leader is, making it more difficult to decide what size tippet to add. 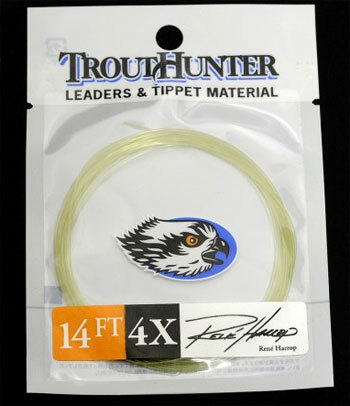 If you know you want a 9-foot 4X leader, you can simply buy a 7-1/2-foot 3X leader and add 18 inches of 4X tippet. Everyone knows that knots weaken a leader, but even the knots that you can undo take their toll on the breaking strength and the straightness of the leader. The better you cast, the fewer knots you’ll create, and the longer your leader will last. This is just one of the myriad benefits that come from learning to cast well. Finally, if you are dragging you leader over rocks, stepping on it as you rig your rod at the car, or generally not looking out for its well-being, it won’t last as long as it should. A good caster who diligently adds tippet to a leader and protects it from abrasion can use the same knotless tapered leader for many fishing trips. If you are changing your rig from a dry fly to a streamer setup, carefully rewind your leader and put it back in the package. If you take care of your leader, it will take care of you.